BioBliss has developed a revolutionary toxin-free technology that can reduce the appearance of wrinkles in under an hour. It is available for crow's feet, under eye and forehead wrinkles. You will be amazed at the results you'll see after using one of their pre-loaded anti-wrinkle patches. Did you know that over 96% of the ingredients in creams just sit on the surface of the skin and get washed away or evaporate? BioBliss uses a better delivery system than conventional beauty treatments. Estheticians have been using a technology called "galvanic micro-current" for decades to enable cosmetic ingredients to penetrate the skin. 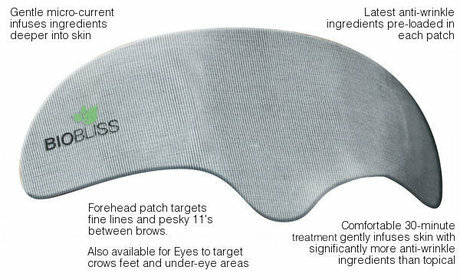 BioBliss uses a unique version of these delivery technologies to wrinkle reduction in the form of the BIOBLISS patch. BioBliss patches infuse the skin with more active ingredients than other topical treatments in a convenient and pain-free manner with results similiar to those of botox, but without needles in an hour! I received a sample of the BioBliss forehead patch for my review. I do not have deep lines, but I used it anyway to see how it worked. First, I washed my face using a mild cleanser. After thoroughIy drying my skin, I peeled the patch from the package and applied it to my forehead with gentle pressure. There is a tab (not shown in the photo above) with a tiny green blinking light at the corner of the patch. I pressed the tab to activate the green light which blinks for an hour and stops, letting you know that your treatment is complete. After my hour was over, I removed the patch and discarded it. Next I applied a moisturizer. I was so amazed at the results! My fine lines were completely gone. It has been one week and I stil do not see them. If it worked like this on my fine lines, I can only imagine what it would do for deeper lines.